Here’s how I made them: There was no pattern to so I just cut the fabric into 7 by 8-inch shapes and rounded the corners. I used two thicknesses per pot holder so before adding the binding, I first connected the pieces together to keep them flat. I did that by sewing two seams – each one diagonal from corner to corner. Then I used Double Fold Bias Tape (extra wide) for the edge. I used an old existing pot holder to see how to secure the “loop.” I love how they turned out. A safety note: I used two thicknesses but when I baked a cake at 350 degrees and used my new pot holder to remove the pan, a little heat came through by the time I put the pan on a rack so when I make more, I plan to use 4 thicknesses instead of just two and I suggest that if anyone makes them, to make them thicker or just use them as decoration. Next time I plan to use some leftover plain quilted fabric for my extra filler and save my fancy fabric for the outside. 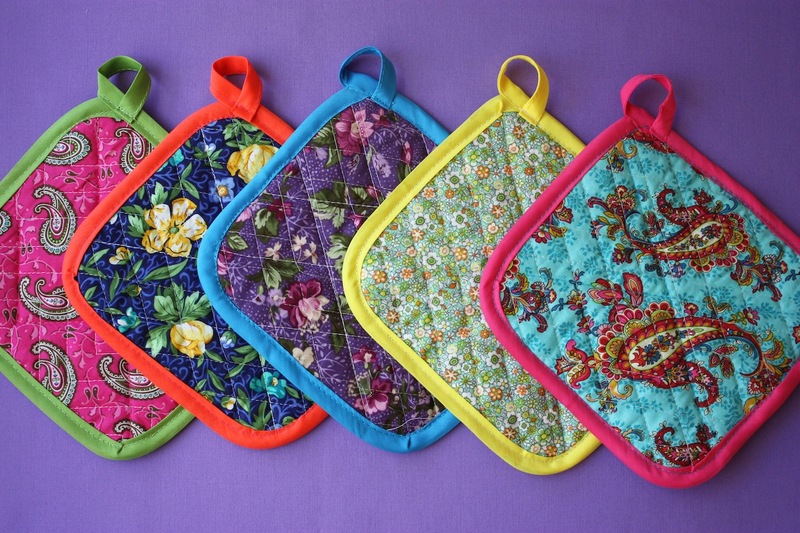 24 Comments on "My Homemade Pot Holders"
Love your blog!! Thanks for the homemade pot holders idea. Jenny, where did you get your gloves that you used in the baby back ribs video, the gloves that you used to turn the ribs around while they were hot. Also, loved you many years ago and you are still the sweetest gal around. Love your smile and the twinkle in your eyes. 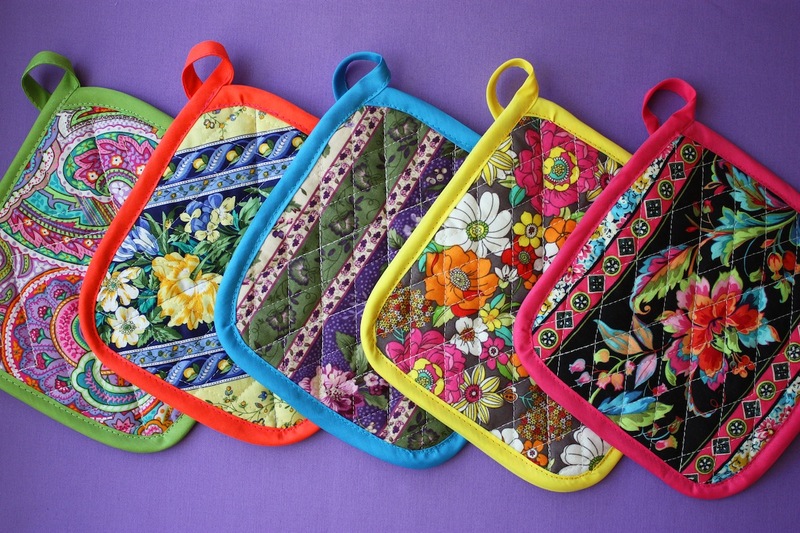 Can original 3M™ Thinsulate™ Insulation be used to make potholders?? No, I just copied some old store-bought ones. hands. It can make the potholder quite stiff, but prevents burns. I use cotton batting and insul bright in mine to make them safer when handling hot pots. Can use insul-brite instead of so many layers. It’s made for that. There is a material you can purchase that has tephlon in it to use for the stuffing.It will make it not so thick to sew. Thank you. I found that and inserted it inside my pot holders. It made a big difference. Are you talking about the Teflon fabric that you can purchase? I bought insulbrite at joanns would this work? So you used the heat resistant fabric and you still felt the heat? Hi Jenny, If you don’t want the potholders to be too thick (some sewing machines can’t handle too much thickness, although a walking foot would certainly help) you might try a layer of Insul-brite between the fabrics. It’s heat-proof, or heat-resistant. You put the shiny side on the side that will touch the hot surfaces. If both sides will, you’ll want to use two pieces, but I think it will still be thinner than sewing through four thicknesses of quilted fabric. Jenny, If you don’t already know about it, there’s a terrific sewing web site called sew4home.com with fabulous free tutorials for all sorts of projects. I’ve made dozens of their things, from pot holders to aprons to zipper pouches and toys. Thanks for that web site Ms Gloria. I will check it out. Just getting back into sewing, need all the help I can get. Nice potholders Jenny! Hilarious mitt comment too! Hi Jenny! I love what you did with those potholders. I saw too and keep promising myself that I will make some and haven’t got to make them yet. But, my plan is to use old washcloths as filling because, as you experienced, even two layers of quilted fabric are not enough. When, eventually (I love this word…) I will make them, I will post a picture for you to see. Thank you for being there for us. I love your site and am glad I found you!